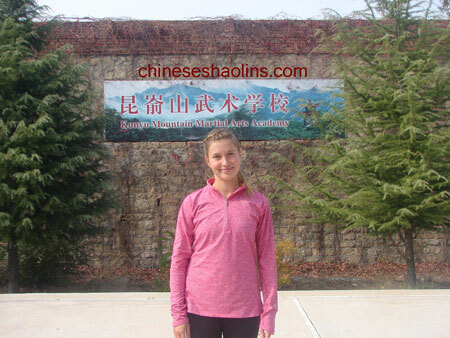 ﻿ Kunyu Mountain Traditional Shaolin Martial Arts Academy is great. I have never been to China and I wanted to experience travelling on my own. Also, I have been interested in Martial Arts all my life. I learnt a lot kungfu.And the greatest gain from the training has been getting to know my limits and especially learning from My master the importance of working hard to achieve your goals. My master influenced me a lot of and helped me to push as hard as I could. Also, the many highly motivated students with whom I trained and enjoyed my time here. I arrived in Yantai in the summer. I was happy to see the translator (Rachel) who was there to pick me up. I loved the training from the first day and I worked as hard as I could. Quickly, I noticed that it is good to pace yourself, especially in the beginning because you are training every day and your body needs time to adapt. The daily life is great, the timetable is followed and you have the opportunity to do optional classes. These classes can give you a basic introduction to several aspects of the Chinese culture; Mandarin, massage, acupuncture, et cetera. Nearly all of the training is done within the walls of the academy. The two training halls and the courtyard provide enough space to comfortably do the training. The masters are fantastic, easily the most impressive aspect of the school. However, communicating with them would not be possible without the translators. They work hard to help you talk with the masters but also for any other questions you might have about the academy or activities in the nearby cities. The weekends are great opportunity to relax and socialize with your fellow students. Either in the restaurants that are close to the school or in the nearby cities (the school can call taxis for you). Of course, the most important reason for being here is training and as I said before, the masters are fantastic and work really hard to provide you with a proper training. The surroundings of the academy are beautiful. Every Friday we visit the temple that is shown on the website to do the mountain run. The air is clean and the surroundings are very peaceful. In the summer it’s possible to go to the nearby lake for a refreshing dive. Finally, Yantai city is a great city to explore on the weekends. There are a lot of places to eat and drink, the beach is nice in the summer and the different shopping malls provide nearly anything you could want. At the time of writing a supermarket has opened very close to the academy which is very useful. Yana Kron (Germany) -- Two months training from September 2014. 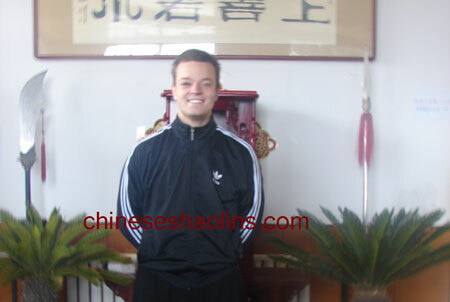 I saw a German TV internet with Andre Jehan Vallendar and he talked about his Kungfu experience in China. so I contacted him and asked where he was and how it was. (he was in kunyu mountain in spring 2014.I learned a lot of my own power that I can get through nearly every limit. I learned that I am a fighter and that I can do a lot of things I never thought I could do. The masters where great, especially my master . He really pushed me and helped me. Many other students helped me. Many other students helped me when I had a problem or a question or needed help. I was great to develop a feeling like being with a big family and having the feeling that everyone cares about you. The training is tough but doable even if you have never done martial arts before. The shifus are strict but fair. You will always find some people that help you and care about you. The surrounding is very nice to look at.